Calcium hydroxide is used as dressing material for both unexposed and exposed to the pulps. This is a strong alkaline mixture with a pH of about 12, causing superficial necrosis about 1.5-2 mm in the area under its placement on the open cellulose. After the initial irritation subcutaneous tissue, pulp produces new collagen and after that bone-as hard tissues. Avoidance extrapulpal blood clot is essential when using calcium hydroxide as dressing, because its presence may hinder pulp healing. It is therefore important to use a gentle equipment, including cutting with high-speed equipment and diamond burs with subsequent irrigation with water or saline in order to achieve hemostasis. 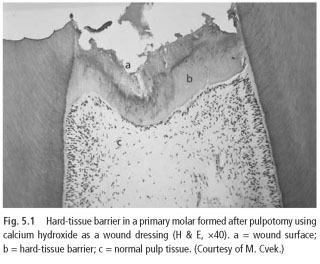 Formation of a hard cloth barrier, although seldom complete, protects mechanical pulp and provides partial protection from bacterial infection. Although it should be noted that the presence of such a barrier is often considered a criterion of success of the treatment does not guarantee a healthy residual pulp. Unsuccessful outcomes pulpotomies with the help of calcium hydroxide as dressing attributed to a blood clot left between the dressing and wound surface (73).